Well, if there are any things I really wanted/needed to do before the end of the year, I'd better get moving! To be honest, I can't think of anything that falls into this category (other than paying some bills this evening), but it is still almost the end of the year. A lot of people do end-of-the-year posts about their most popular posts, their accomplishments, or even the worst about the year that is nearly at an end. I have been giving it some thought, and decided I was going to list 13 Things in 2013, so here you go. 1. In August, The Tim's oldest sister died unexpectedly. It was sad, not just because of what it was, but because of how it happened. And in the end, it seemed that after her husband died last year, she gave up on everything, and kinda died of a broken heart. They were both sweet people, and were my favorites in his family. I can only hope now that they are together and in peace. 2. Shingles. Enough said about that. 3. I started going to a new internist this past summer, and so far it has been a real improvement. My old doctor was someone I'd gone to for years, and though he was very nice, and very responsive, the past couple of times I'd had respiratory issues, I really feel that his hesitancy to give me strong drugs led to having pneumonia twice in two years. I had a really bad cold a few weeks ago, which was taking the route that had led to pneumonia before, and the new doctor really decided to kick it at the beginning. It cleared up and even my cough didn't last as long! 4. I failed to complete two reading challenges I'd signed up to do. But on the other hand, I read two more books than the goal I had set for myself on Goodreads! 5. 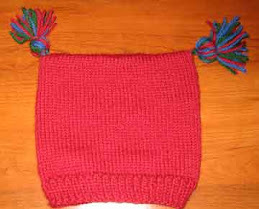 My knitting output was pitiful, but fortunately, I was pleased with what I did complete. 6. My niece Julie and her husband Keith, who live in Brooklyn, are expecting a baby girl in May, so another great-niece will join the family! 7. 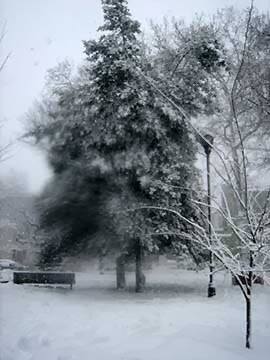 It snowed a couple of times this fall, and even though we didn't have a white Christmas, it was a cold and sunny Christmas day, which meant it felt the way it should, and that we could have a fire in our fireplace. 8. I didn't manage to clean out/clear out as much stuff around here. But on the plus side, I have been managing to slowly take the clothes that don't fit me any more but are still in decent shape, and donate them. I hope they have made someone happy. 9. Early in the year, I had the chance to meet a friend that I "met" on Facebook through two other real-life friends who knew her. She was as much fun in person as she is online. And it was a kick to be around a stranger that I felt like I already knew. 10. Even though I wasn't as active and didn't exercise as much as I had planned to, I did manage to keep my weight about the same. 11. In October, The Tim and I celebrated our 35th wedding anniversary, which counts for saving power if nothing else. 12. Over the summer, I went with a group of friends to Stitch 'n Pitch. Cole Hamels pitched, the Phillies won (a real treat this past season! ), and it was one of the most fun times ever. 13. We didn't have the chance for a big vacation, but we had a great trip to Rehoboth Beach in September, staying with my niece Amanda and her husband Pat, who have a house there that is shared in his family. It was a wonderful weekend. Dug went with us, and I think he had the best time of all. So overall, except for the true sadness of losing Sheila, it was a year of more good than bad. Death is a huge "bad" of course, but the important thing is for the rest of us to go on living our lives since we are still here. We are all relatively healthy, pretty content, and ready for 2014. Here's hoping it will be a good year for all of us who have made it through 2013! Hello and Happy St. Stephen's Day, or Boxing Day, or day after Christmas, or whatever you choose to call it. We had a wonderful Christmas Day, which I shall go on and on about regale you with in another post, but I wanted to show you something from today. I named them Rudy (the pup) and Reiny (the reindeer). They seem pretty pleased to be here, and have been getting lots of kitty rubs, as well as being sniffed but left alone buy Dug. On an unrelated note, today would be my parents' 72nd wedding anniversary. They got married on this date because my dad was in the Army, and being sent to El Paso, Texas. At the time, you couldn't get married during Advent in the Catholic Church, so December 26th was the soonest after it was over that a wedding could happen. Please join The Tim and I in raising a glass to them tonight. That's it for now, but I'll post again soon about our Christmas Day festivities. I hope yours was as wonderful as ours was! that will be for all the people." Christmas Day is nearly here - only 5 more days to wait! My background - as you may have guessed - is Irish American, and when my grandparents came here, the idea at the time was to become as American as possible, so you didn't "stick out." Especially if you were Irish, which was not considered a good thing. As a result, a lot of the Irish traditions were put aside, so that they could celebrate American Christmas. However, in the spirit of things, Carole has said that if we do not have a lot of ethnic traditions of our own, we should list 10 Traditions You Observe For The Holidays. That is what I am going to do, listing a mishmash of family traditions, as well as ones that The Tim and I have created for our own little family. 1. The definition of Christmastime. We observe Christmastime beginning December 1 through January 6. This is something that I have done since childhood. My mother's birthday was December 2, so we didn't put up any decorations until after that, but we could play Christmas music starting December 1. And the last day of Christmastime is January 6, the Epiphany, when the Wise Men arrived at the manger. Decorations never even think of being put away before then. 2. Christmas Eve. This has always been a big deal in my family. It's kind of the ultimate day of anticipation and preparation. The Tim usually has to work on Christmas Eve, and doesn't usually get home until 7:00 pm or so. I spend the day doing any last-minute preparations around the house, and making our dinner for that evening, Christmas Eve risotto. If it's not pouring rain, I like to go out for a little while and walk around enjoying the hustle and bustle. Once he gets home, we have our dinner, then put on our pjs and watch "It's a Wonderful Life," while having a gin and tonic, then put the gifts under the tree, fill the stockings, and sit in the dark by just the Christmas tree lights until it's time to go to bed. 3. Christmas Eve Risotto. A few years back, The Tim found the recipe, and we always have it on Christmas Eve because it has broccoli rabe and red peppers in it - thus red and green! 4. Baby Jesus gets placed into the manger. At midnight, our baby Jesus gets placed into the manger, after all of us kiss him and say "Happy Birthday, Baby Jesus." 5. "It's a Wonderful Life." This must be watched on Christmas Eve, while having a gin and tonic, and you must be wearing your pajamas. 6. "The Night Before Christmas" - we always read this aloud on Christmas Eve. 8. A too-small dish for the cranberry sauce at Christmas dinner. This goes for Thanksgiving too, but the cranberry sauce for dinner must be in a dish that is too small. This is something that we always did growing up, and I found out as an adult that it was just because when my parents were first married, they didn't have a dish large enough for the cranberry sauce! There are other things we do, and that I have always done, but these are the things that came to mind first. As I said, some are family things, and some we have created ourselves. They make the whole Christmastime experience better, if you ask me! A week or so ago, I wrote a post on my other blog about how, now that The Tim works a varied, busy schedule during the holiday period, we don't do very many Christmas-y things together anymore. It took some adjustment on my part to get used to, but now it's just the way things are. Well, this past Friday, we had a chance to do something together, and it was one of the best Christmastime days EVER. I was lucky enough to receive two complimentary tickets to Longwood Gardens, which is about 40 minutes from our house in Center City Philadelphia. As long as we've lived here, we've never visited before, even though I don't know anyone who has gone who has not raved about it. Every year, they have a well-known Christmas display, and fortunately the comp tickets included admission for this time period. So, since The Tim had the day off, I took the day off, and we took ourselves out to breakfast, then headed to our destination. There was snow, but it had been around long enough that the roads were clear. It was cold, but sunny. We walked, oohed and aahed, took pictures, had coffee and tea, joined in a Christmas carols sing-a-long with the amazing Aeolian organ in the ballroom there, and even saw one of the Longwood Gardens resident cats! My descriptions would not do any justice to the whole thing, so here is a selection of pictures from the day. Enjoy - and if you ever have the chance to go, do it! Last week one day, I was reading one of my usual blogs Sprite Writes, and she mentioned being a part of this year's Virtual Advent Tour. I was intrigued, and followed her link (as I hope you will follow mine), and decided it just sounded like so much fun, I wanted to join! I was given today's date, and have been thinking about what I wanted to write when it was my turn. "Each day anyone who wants to participate takes turns sharing a treat with our friends here in blogland. For example it could be something about your family traditions, recipes, your country's holiday traditions, or a favourite Christmas memory, movie, book, song...anything you like. Even if you don't celebrate Christmas we would like to hear about what your family does during the holiday season, whether it be celebrating Hanukkah or Kwanzaa or whatever it is that you do during this time." I had several ideas, and when it came down to choosing something, I decided to re-post this piece from 2009. It is one of my favorite Christmas memories, and one of my very favorite Christmastime posts. The thing I just noticed is that it is dated exactly four years ago today - which makes me think it is definitely the right choice! For those of you who will remember reading it, you may just want to wait a few days for a newer post, but if you haven't seen it before, I hope you will enjoy it. It happens to me every year in December, but it's not something I can predict, or make happen when I want to. It just happens when it's ready to happen, and to be honest, it's a bittersweet experience. You may have noticed that I am quite the fan of holidays, and Christmastime in particular. I get this honestly, in particular from my father. He grew up during the Great Depression, in a family who lost their father as youngsters (my father, the oldest, was only 13), and where the kids (4 of them) were split up among relatives afterwards. 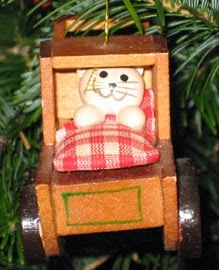 In spite of hardship - or perhaps because of hardship - holidays were extremely important to him. Of course, this was just fine with my sisters and I. My father loved to cook and bake, but was not home a lot due to his work, so the "big" holidays - Thanksgiving, Christmas, Easter - meant he would not just be around, but be the one cooking. In spite of the fact that this entailed him using every single pot and pan, and every single dish for his preparations (which we then had to wash and dry later), this was something we looked forward to and counted on. Though my mother loved to eat, she was not too crazy about cooking. And needless to say, we never starved, but we couldn't wait for Dad to be home and be the cook! I will admit to being a Daddy's girl. I was the youngest (by quite a few years), and so was nearly always home when my Dad was still around. Thinking back, I realize that I probably drove him nuts hanging around with comments, questions, etc., but to his credit, he never treated me like he wished I was out of the way, even for a while (or, if he did, it was never obvious to me). I loved to "help" him cook, watch baseball and/or football, clean - whatever he was up to, I liked to be right there. My father died of liver cancer when I was 13 years old, at a time when a diagnosis of liver cancer literally meant no hope of any amount of survival time. This past November 24 was the 40th anniversary of his death, which occurred on the Monday of Thanksgiving week that year. I could write volumes about this, but this post is not meant to make you (or me) sad, but rather to share something with you that happens every year at Christmastime. As I said earlier, I cannot wish this experience, or predict it. But it happens, and even though I more or less expect it, I am always thrown by it. I can be reading, doing dishes, decorating the Christmas tree, or at work, and all of a sudden it happens. I am walking in the door from school in the second grade, and my father, who is home recuperating from one of his many cancer surgeries, is there - in the middle of the afternoon. 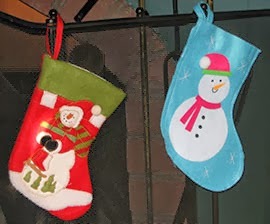 He is putting up Christmas decorations, more specifically, hanging our Christmas stockings for Santa to fill. The most amazing thing? They are new stockings that he went out and bought that day. And mine is green with Santa coming down the chimney! Do you realize what that means?? GREEN. Not red, like my sisters' and everyone elses' stockings. And not just with Santa onit, but Santa coming down the chimney! As far as I know, nobody else in the world has such a stocking, but my father found one, and knew it was the right one for me! I remember the feeling of special-ness, of knowing that Santa cared about who I was that that particular stocking represented. Of course, now I realize that my father probably bought a green stocking with Santa on it because he wanted us to each have a different stocking and the remaining red ones were the ones he had already chosen for my sisters. But at that moment in time, it was one of the most amazing experiences of my life. And every year, out of the blue, I am unexpectedly transported to that very moment, surprised, pleased, and thinking my dad is the best because he knew I needed that stocking. When the moment is gone, I'll admit to being sad, at least for a minute or two. But it's always the point when I know that Christmas has officially arrived, and that my dad is never that far away. For the past few days, the meteorologists on the TV and the radio have said that a storm was coming. But each and every one of them said that in Philadelphia, we might get a few flurries or a coating, but it would be mostly the never-popular "wintry mix" and would turn to rain overnight. So far, it's more than 4 inches. Usually, they spend days warning us that we could get A MILLION INCHES OF SNOW (yes, I'm exaggerating ...), and then it barely rains. They seemed to have missed out on something for today's forecast - even this morning when I left to go to Rosie's for my shift, they were saying it would just be wet, and it was already snowing pretty hard then. But you know what? It's December, it's snowing, and there are 17 days until Christmas. One of my favorite things about Christmastime at our house is that it doesn't happen all at once. Most of our decorations are packed away and in the basement, but some are more easily at hand. It would probably not surprise you to know that they show up first around the house - the Christmas linens, the smallish items that can be packed and cushioned by being in that box as well. We actually kind of "build" to Christmas! 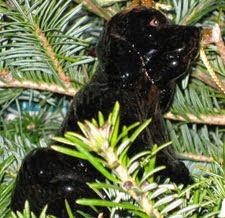 A lot of our decorations are ones we have had since we have been married, with various themes - our pets, our trips, family. And of course there are newer ones as well that we have chosen or that have been gifted to us by others. But even before those first things mentioned above show up, this decoration is taped onto the inside of our door. 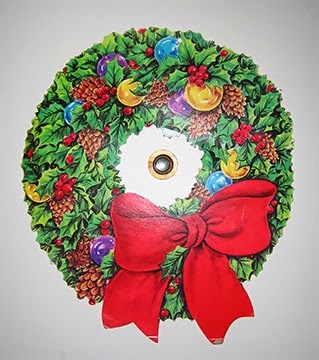 Yep, a cardboard Christmas wreath. 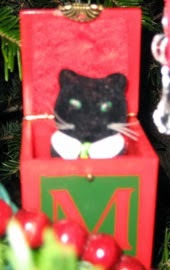 It's one of the first decorations we ever bought together, at our first Christmas after we were married. It hung on the outside of our apartment door (which was inside, protected from weather) when we lived in married student housing at the University of Notre Dame, where The Tim was in graduate school, and I worked in the library. We had neither a lot of money nor a lot of room for decorations, but were determined to make our place look Christmas-y. Until a couple of years ago, you could see the price marked in pencil on the back (69 cents!) Most of the year it lives in a plastic bag in the basement, with the other non-Christmas things. When I take the few things we have for Thanksgiving to put them away, it's right there, so it's easy enough to just bring it upstairs and add it to the door - voila, Christmastime has begun! Is it cheap-looking? Yes. Cheesy. Yes. 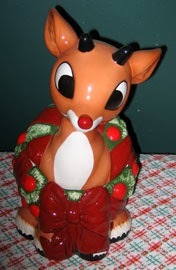 But it's also colorful, cheerful, in one piece, and full of Christmas memories. And in our house, it means the festivities have begun! Not a bad deal for 69 cents, if you ask me. December is all about anticipation for me. Christmastime is my favorite time of the year, and I think part of it is that it's nearly an entire month of happy anticipation, followed by celebration. A lot of people don't enjoy December, Christmastime, or anything about it. Which is up to them, though it really annoys me when they have to tell you every single time you see them or talk to them. We all know someone who falls into this category, and we all have to listen to them, regardless of our feelings about things. It occurred to me today that for a lot of aspects of my life, I have decided for myself the way things are, and I work hard to follow my patterns and beliefs that I have devised. I am also good at compartmentalizing things. For instance, when Christmas decorations go up at stores immediately after Halloween, I have no trouble ignoring them altogether. Because Thanksgiving comes first, and should never be eclipsed by Christmas, as far as my beliefs go, so those way-too-early decorations are compartmentalized in a place where they are completely ignored. I can then easily enjoy Halloween, anticipate and enjoy Thanksgiving, and only then give any serious attention to Christmastime. It's all part of my own "rules" and it works for me. I guess I enjoy holidays so much, that I don't want any of them to be cheated out of their special-ness. This year, I'm not going to go out of my way to be rude, but I'm going to ignore the holiday grouches. They can be miserable, angry, frustrated, or morally superior to their hearts' content, and I am not going to stick around for it. Life is too short to allow others with no Christmas spirit to decide the atmosphere for everyone. Christmastime only comes around once a year. And every bit of it is worth my time.